Its’ 2 minutes until you walk down the aisle, your mouth is dry, and all you want in the world is a mint. “Who has a mint?” you yell out to your girls. Silence. No one put those Altoids in their tiny purse. Or, even better….you go to zip up your dress and snap! Zipper breaks (yes, this happens ladies!). What are you going to do now? Anyone have a sewing kit? You better hope so! Having an emergency kit on your big day is a NO BRAINER! You need to be prepared for anything, and I mean ANYTHING. I have sewn a dress on a bride minutes before she has gone down the aisle, I have super glued her heel back on her shoe right before the first dance, I have even gotten a red wine stain out of the train of a gown using only a TidePen. Desperate times call for desperate measures. Hopefully your coordinator (yes, you should have a coordinator!) will supply you with an emergency kit for the event. This kit should have more than the basics, you should be able to live out of this kit for a few days! ha! Well, I’m only partially kidding! In the case you are putting together a kit for yourself, my top must-have items are listed below. But again, don’t stop here…. the more items you have, the better prepared you’ll be. If you are allergic to bee stings, tuck some Benadryl in there just to be safe (can you imagine if you were stung!). If you or your bridesmaids have a low-cut gown on, double-sided tape will work wonders. 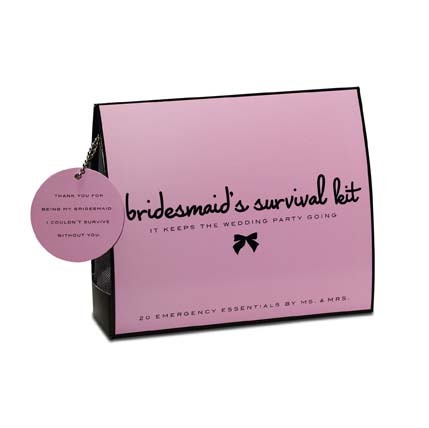 A great gift idea for your bridesmaids is a mini emergency kit. How cute is this?